The last feature made by the distinguished duo of Powell and Pressburger is one of three films featured on a new volume of Children's Film Foundation tales, Weird Adventures, released on DVD by the BFI on 17th June. This latest collection brings together Alberto Cavalcanti's The Monster of Highgate Ponds (1961), Powell and Pressburger's The Boy Who Turned Yellow (1972) and A Hitch in Time (Jan Darnley-Smith, 1978) which stars Patrick Troughton. In The Monster of Highgate Ponds (1961), young David promises to guard a mysterious egg which his uncle brings back from Malaysia. But when a baby monster hatches, mayhem ensues as David struggles to keep the unruly, but friendly, creature from falling into the clutches of two ruthless crooks. This enchanting tale, shot on location on Hampstead Heath, features brilliant animated sequences by the legendary Halas & Batchelor, who also produced the film, and was directed by the celebrated Ealing director Alberto Cavalcanti (Went the Day Well?). The Boy Who Turned Yellow (1972) is the splendidly eccentric final collaboration from eminent filmmaking duo Michael Powell and Emeric Pressburger (Black Narcissus, The Red Shoes). London schoolboy John Saunders turns bright yellow after losing his pet mouse on a school trip. Is the mysterious colour change the result of an alien invasion or does the answer lie closer to home? In A Hitch in Time (1978), Patrick Troughton (Doctor Who) plays time-hopping inventor Professor Adam Wagstaff. Discovered working on his time machine by two curious kids, Wagstaff decides to send them back through the ages. But, with malfunctions a-plenty, will they be able to make it back? Featuring Jeff Rawle (Harry Potter and the Goblet of Fire) as 'Sniffy' Kemp, the teacher out to spoil everybody's fun, A Hitch in Time is a riotous re­ telling of history. For over 30 years the Children's Film Foundation produced quality entertainment for young audiences, employing the cream of British filmmaking talent. Newly transferred from the best available elements held in the BFI National Archive, these much-loved and fondly remembered films finally return to the screen after many years out of distribution in specially curated DVD releases from the BFI. The fourth volume of CFF films, Bumps in the Night, will be released in October 2013. 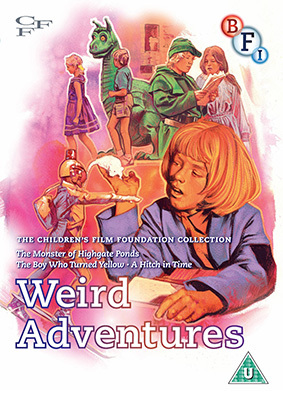 The Children's Film Foundation Collection: Weird Adventures will be released on UK DVD by the BFI at the on 17th June 2013 at the RRP of £19.99. Featuring brand new, high definition sourced transfers of all three films, the release will also include an illustrated booklet with writing by Michael Powell, Lem Kitaj (who played Munro in The Boy Who Turned Yellow), Vivien Halas and BFI curator Vic Pratt.